Did you know over 70% of the PhDs and 90% of the Postdocs have to find a job outside academia? 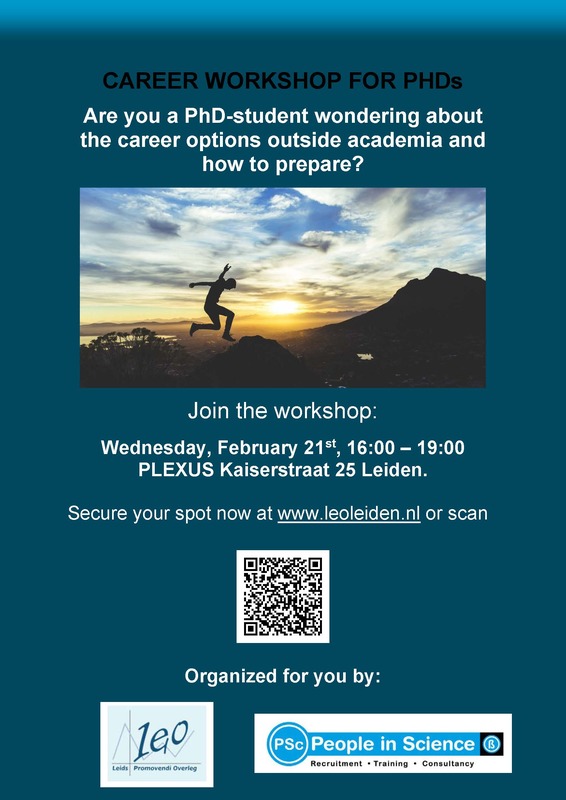 Prepare yourself for alternative career paths with the next LEO workshop on February 21st in Plexus on Kaiserstraat 25 in Leiden! 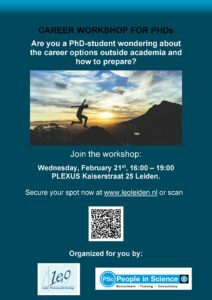 Dr. Geertje Janssen from People in Science (https://peopleinscience.nl/en/) will provide an interactive workshop to help you kick-start your career. Geertje will talk about career options outside academia, the value of your PhD and how to increase your employability. Her insights are validated by current recruitment procedures and job market trends. Additionally, we will provide you with information about general career orientation support available for PhDs in Leiden. Due to limited capacity please be considerate and sign off in advance if you can’t make it, to allow other PhDs to join. Previous PostLEO LAP Party: Calling all PhD-superheroes! Next PostMonthly PhDrinks – Easter!